Hey, all ewe wiener lovers! Dis is Jazzy the Amazing Wiener! I nos dat ewe want to nos all about me, so here’s da scoop, an no, I’m not talkin’ no pooper scooper! 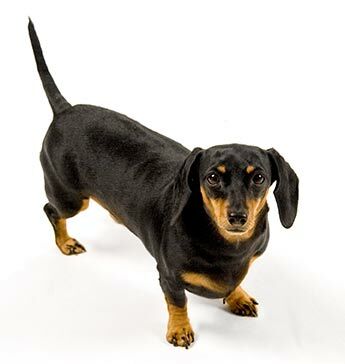 I am a Miniature Dachshund born on January 20, 2003. For dos of ewe dat don’t nos how to say dat, it’s not “dash-hound” it’s “Docks-hund.” An yeah, I might be a weenie dog, but don’t ewe be calling me a wiener unless it’s done wid da proper respect an preferably an Oscar Mayer one! Better yet, ewe kan jest call me Jazzy the Amazing Wiener as dat’s whut all my subjects call me. I live in da wilds of Oklahoma wid two cats, a Boston Terrier named Lily dat’s my pet, and a dopey Doberman Pinscher named Katie. Whut a life I haf! In my spare time, wen I’m not on Facebook or Tweetin’ or takin’ naps, I am a model for my Mom’s greeting cards at TylerDog Cards. I sells more kards dan any of her oder models. I nos it’s because I’m jest so darn cute an no one can resist my charms! Besides, I’m a wiener so dat automatically makes me a winner!